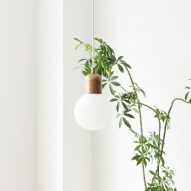 Brooklyn homeware brand In Common With has released its first collection of lamps, which includes in-house designs along with products made in collaboration with Ohio artist Ariana Heinzman. 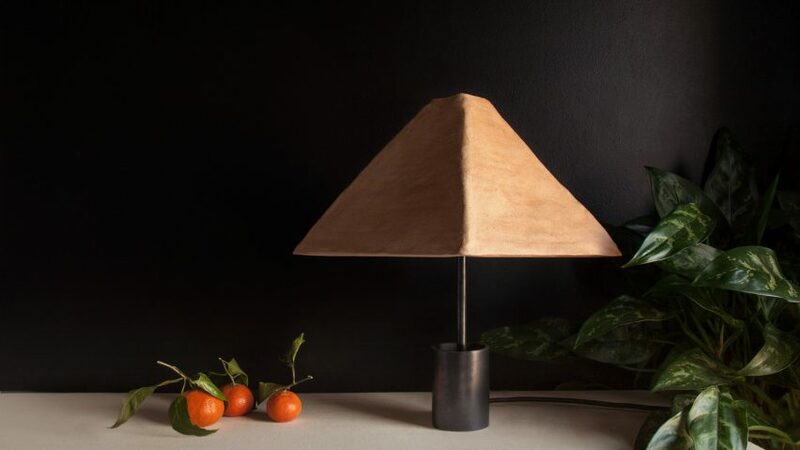 Designers Nick Ozemba and Felicia Hung are the team behind In Common With, which launched the lamps during the NYCxDesign festival this spring. After studying together at RISD, the duo set up the brand with a focus on customisable pieces. "Our goal is to change this pattern of consumption by providing affordable access to custom design, which in-turn reduces the risk of unsold goods ending up in a landfill," said In Common With. "For our first collection, we designed a lighting system because it is one of the most inexpensive and effective ways to transform a space." 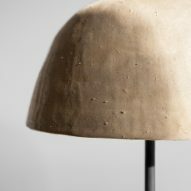 Their debut range includes three designs by ceramic artist Ariana Heinzman, which have hand-pinched clay shades that are highly textured and unglazed. "Ariana Heinzman handcrafts each of the earthenware shades in the foothills of the Appalachian Mountains in southeastern Ohio," In Common With said. Heinzman created the designs in limited-edition runs of 10. She hand-pressed each of the lamp shades, one by one, leaving little cracks and bumps visible. 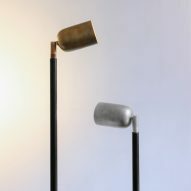 The three variations are intended as sculptural objects that can be displayed and appreciated even when not turned on. 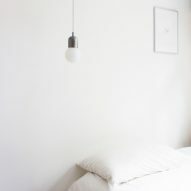 They include the Dome Table lamp, which has a shade that resembles a kitchen bowl turned upside down. 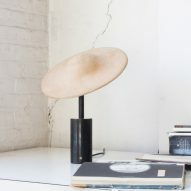 Meanwhile, the shade of the Pyramid Table Lamp references more traditional linen lampshade, and the Alien Table Lamp has a wider-brim shade that resembles a floppy straw sunhat. These orange-toned fixtures are the more rustic designs in the collection, while the other five – designed by In Common With – appear much more industrial and utilitarian, and can also each be customised. 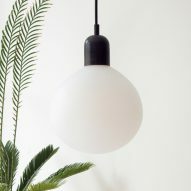 The design for Tipi is based on a hand-spun metal shade, reminiscent of enamelware, with a bulb in two shapes: a bulbous orb or a flat-like triangle. Tipi comes as either a pendant with a cord or as a surface-mounted design. 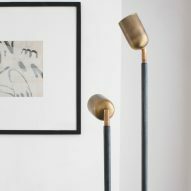 Spot Light and Spot Floor Lamp feature polished metal vase-like forms, taking cues from a traditional spot-light but with a more industrial construction. 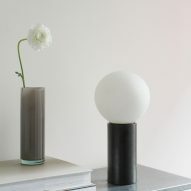 Orb Pendant and Orb Table Lamp are designed virtually identical to each other, with a steel column supporting a frosted globe light. 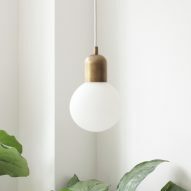 While the bases are the same size, bulbs in small, medium and large formats can be added to subtly change the light's appearance. 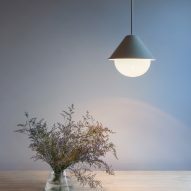 The bulbs comprise an opaline mould-blown glass globe, which diffuses the LED inside to give off a gentle, ambient glow. 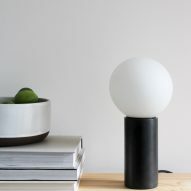 The Orb Table Lamp also comes with a built-in touch dimmer. 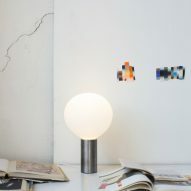 In Common With's lamps are available in various sizes and compositions. 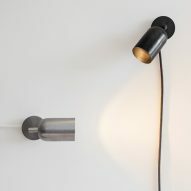 Most come in small, medium and large, with base options in blackened brass, brushed brass or brushed steel. Many of the lights can also be produced in specific colours. 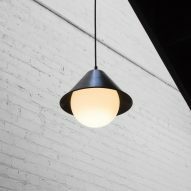 New York's prevalent lighting design scene is continuing to expand. 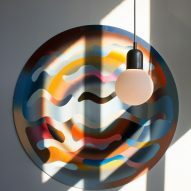 Other examples of recently launched products by designers and brands based in the city include a tubular steel lamp with a high-gloss sheen by Jumbo, a series featuring bent metal, embossed glass and carved wood by Allied Maker, and a layered hooped chandelier made from translucent resin by Coil + Drift.